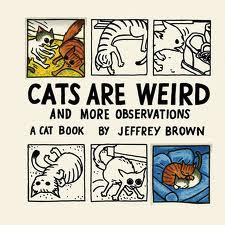 The follow-up to Jeffrey Brown's popular: Cat Getting Out Of Bag And Other Observations is finally in and judging by its interior it is set to be a Librairie Best Seller. In case you haven't seen the first installment, these books are mostly wordless accounts of feline idiosyncrasy. It will totally melt your heart (unless you hate cats).